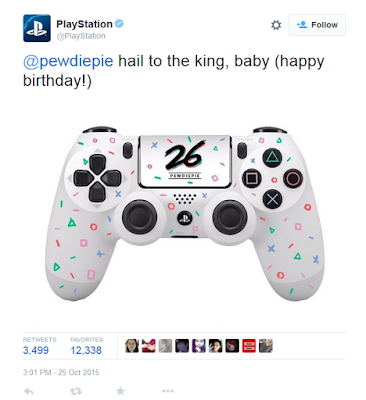 KoopaTV: Sony's PewDiePie Birthday Tribute...? By LUDWIG VON KOOPA - Ugh... Screw (So)ny, Bye. How can anyone still claim that Sony is acting in the best way for gamers at this point? Sony has had a series of missteps/intentional anti-gamer activity since they launched the PlayStation 4. From their insultingly-stupid E3 2014 "outreach" featuring a live-stream of their E3 conference in movie theatres across America and Canada (but only barely in Canada), to their foreclosures of PlayStation Home that put gamers in homeless shelters across America, to their positive name-drop of accursed anti-truth-and-levity hate group NeoGAF at their E3 2014 conference (which I guess all those people saw on the silver-screen and then subsequently vomited their popcorn) to their very, very clear embrace of the free-to-play gaming style as the future of the Sony gaming brand. Oh, and their whole bit about their pretenses regarding the Shenmue III Kickstarter during E3 2015. That should get gamers riled up. Basically, they just outright lied about Shenmue III's circumstances to millions of people watching so people would donate to that Kickstarter. WELL, NOW FOR THEIR WORST THING OF ALL. Would like to also mention that a controller inside a cake is unsanitary. But it's not just one-sided promotion. It's even worse. That skin design is good... for a nursery school. It probably says something about the state of today's gaming world that PewDiePie's tweet gets a lot more activity than the official PlayStation Twitter account's tweet. However, rather than take it as a "Videogame-playing YouTube celebrity scum is much more popular than primary videogame console manufacturer" thing, I'll take it as a "PewDiePie fans are many times more likely to appreciate PewDiePie's birthday gift than PlayStation fans are." What supports that view is that the PlayStation Twitter account actually has more followers than PewDiePie's, so if the likelihood was equal, then the PlayStation tweet should have more activity. What does that mean? It means your average Sony fan isn't in the tank for these talentless YouTube hacks. So what does it mean when the company advances things that aren't in the interests of their fans? It means they're either being paid off, they're out-of-touch, or they're trying to advance an agenda and shape the opinions of their underlings. Like the GayStation 4 incident, except I don't think Sony themselves was actually involved in that. 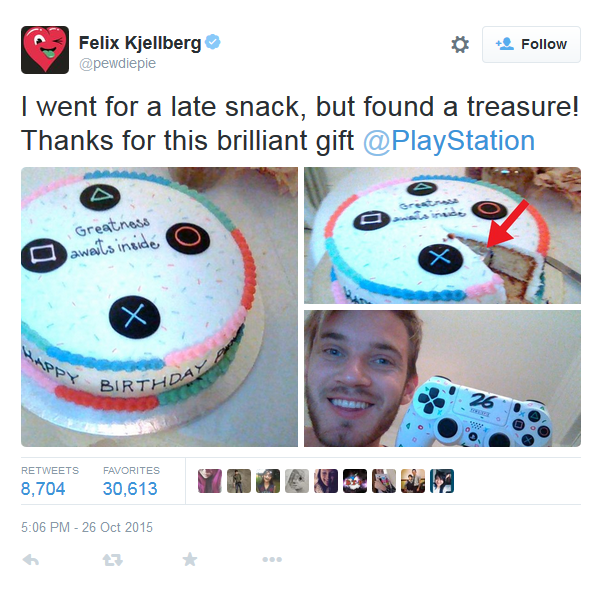 What is in common is that there are customised skins of PlayStation 4 systems/controllers in both instances made for the purpose of making the recipient group feel really good about themselves, and to demonstrate that the giver is in "solidarity" with that recipient, whether it be homosexuals or PewDiePie. And the latter has an ego so big he's his own "group." As Sony says, he's a "king." You know who is the real king around these parts? King Dad, and you don't see Nintendo making intentional tributes to him. You do see them lying about his personal life, though. Tomorrow (Wednesday) is Republican Debate Night #3 for the 2016 presidential nomination on CNBC. It's supposed to focus on the economy, but maybe if they're lucky one of the candidates will take a stab at Sony's shameless promotion of race-baiters and videogame censorship advocates Al Sharpton and Jesse Jackson. Yet another reason that Sony is against the common gamer's best interest. Ludwig is proud to be a supporter of the videogame company at the frontlines of taking down PewDiePie's "reign" over prevailing gaming thoughts and culture. He invites any Sony fans that feel disenchanted by Sony's moves to court PewDiePie to convert over to Nintendo. Ludwig agrees with Jimmy Kimmel's message that watching Let's Players is stupid, anyway. 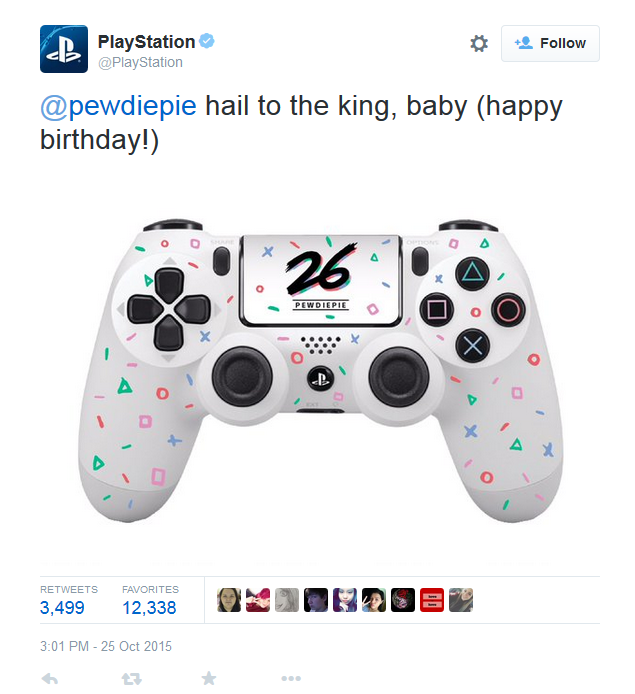 Could Sony be trying to get the support of children to drive PS4 sales by supporting PewDiePie? Let's Plays could be useful for bringing awareness to very obscure games. An example is Brickroad's LP who brought attention to a certain Game Boy Color game about a certain half genie and half human named Shantae. This was before Risky's Revenge and Shantae still remained unknown. Wayforward showed their appreciation him by giving him a DSi with Risky's Revenge (way before 3DS was even announced). Of course it just feels like grabbing attention when someone Let's Plays a very well known game which gives very easy views. I've written about this several times, but what happens nowadays is that developers make games just for LPers to LP. So they make games that mesh well with watching an imbecile play it with their idiotic comments, but aren't actually all that nice to play. There's also the fact that PewDiePie is absolutely obnoxious. Also looking at the viewcounts of Brickroad's LP and that's not that much awareness there. I'd say stuff like Nintendo Power giving a lot of pages to Shantae-related things over the years did a lot more. Nintendo Power is certainly more plausible. Nintendo Power had a "Shantae is underrated and we want to see it back" message, and always had WayForward interviews. Nintendo Power was great about this. Maybe it was because they were an exclusive magazine, but they were able to give attention to everything that came out on Nintendo platforms, and made quite a few obscure gems cult classics, possibly most famously with Killer7, where they actually slapped Garcian Smith on the cover. They were able to share their opinions on what made games great in a compelling way that didn't take away from the experience of actually playing them. Streamers don't do that, and that's why I don't think their audience is one worth pandering to. Ooh, good job connecting that back to the streamers.